Modern image enhancement techniques, including Artificial Intelligence, are nowadays widely applied in society, for example to sharpen low-resolution TV image broadcasting and security camera images. Therefore to get more information from PROBA-V’s 300 m cameras, ESA is challenging ‘citizen scientists’ in a public competition to apply these so-called super-resolution techniques to enhance images taken by PROBA-V’s 300 m cameras towards the center camera 100 m resolution. The competition runs from November 2018 – April 2019, more information on the competition and its background can be found at the Kelvins website. 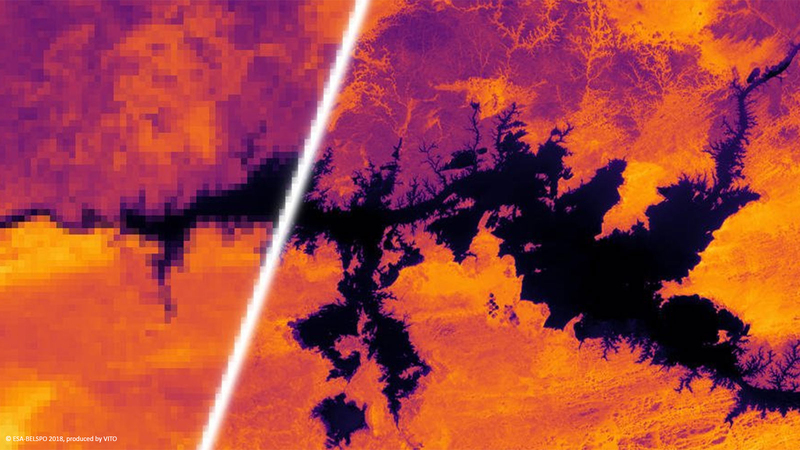 An example of the enhancement of PROBA-V’s 300 m image resolution to 100 m is given above, with the nominal 300 m resolution image shown left and the super-resolution enhanced 100 m-like image right.